CLEVELAND – The Cleveland Cavaliers have signed free agent forward Richard Jefferson, Cavaliers General Manager David Griffin announced today from Cleveland Clinic Courts. Per league and team policy, terms of the contract were not released. 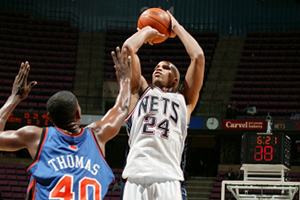 Jefferson (6-7, 230) has appeared in 1,008 games (791 starts) over his 14-year NBA career with New Jersey (currently Brooklyn), Milwaukee, San Antonio, Golden State, Utah and Dallas. He has averaged 13.9 points on .465 shooting from the field, 4.3 rebounds and 2.2 assists in 30.9 minutes per game. He also holds career shooting percentages of .380 from the three-point line and .771 from the free throw line. In 2014-15, Jefferson played in 74 games (18 starts) for the Mavericks, averaging 5.8 points on .444 shooting, including a .426 clip from beyond the arc, and 2.5 rebounds in 16.8 minutes per game. The 6-7 forward out of Arizona was a member of two NBA Finals teams with the Nets (2002 and 2003) and has played in 105 playoff contests (73 starts) over his career with averages of 12.8 points on .470 shooting from the field, 4.8 rebounds and 2.1 assists in 31.2 minutes per game.